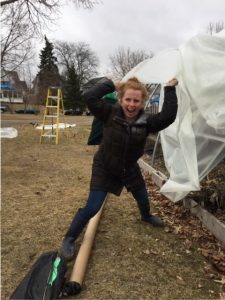 The wind was no match for Youth Farm this week as our Minneapolis Team put the plastic on our hoop house at Green Central. 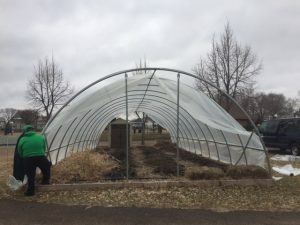 We are excited to kick off the growing season early thanks to our partnership with Minneapolis Parks and Recreation and Green Central School. 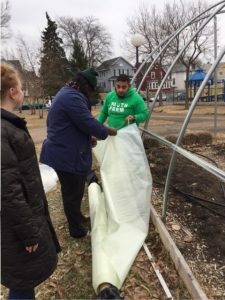 Special shout out to South Minneapolis Manager Jesus Perez and Hawthorne Organizer Marcus Kar who came in as our “closers” to put the final touches on the hoop house! South Minneapolis Manager Jesus and Hawthorne Organizer Marcus prepare to hoist hoop house plastic over the frame. 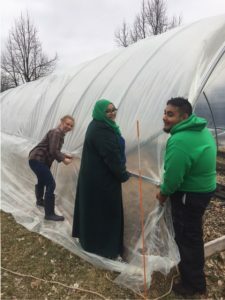 School Partnerships Coordinator Jordyn proves that Youth Farm is stronger than the wind as she holds the plastic down. Jordyn, Jesus, and Farm Steward Zainab wiggle wire it secure! Previous PostPrevious Welcome School Partnership Coordinator Jordyn Ryan!